The AIS Engine 3 is supplied with a free copy of SeaClear and a trial version of Software on Board. 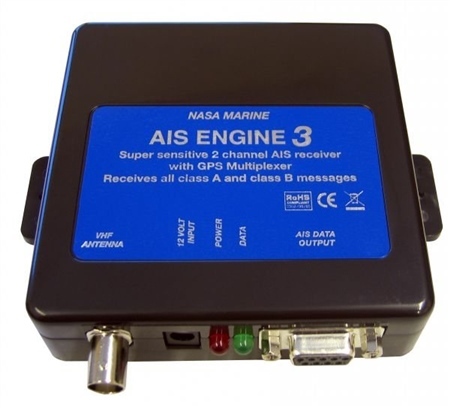 A data cable to connect to the 9 pin serial port of a PC and a 12 volt power cable The AIS Engine 3 and a conventional marine antenna are all you need to start plotting vessels on your PC or AIS compatible plotter. The software runs in windows 95, 98, ME, XP, 2000, NT and Vista, it includes a world map on which vessels are plotted. Any vessel on the screen can be selected and its AIS data displayed. This includes the vessels name, MMSI number, position, call sign and destination etc. Also included on the AIS Engine is an optional input for a GPS (RMC sentence). With this connected the users own vessel is shown on the chart with its latitude and longitude displayed in a window. The unit can receive ships on either the A or B AIS channels. In default setting it alternates between the two channels. The AIS engine can also be used with plotters or other PC software that have an AIS input facility. Check compatibility with your software supplier. An NMEA 0183HS input at 38,400 baud is required to accept the VDM AIS strings corresponding to ITU-1371. If your PC does not have a spare 9 pin serial port a low-cost serial to USB converter is available as an optional extra.